With our all day TV and messages flying across the Internet we might be inclined to think this interest in the royal wedding is a result of modern communications. But this is far from true. The fact we fought the Revolutionary War to gain freedom from the British Empire appeared to be soon forgotten. Queen Victoria's wedding in 1840 wasn't just the talk of the town, it was the talk of the western world. "Thousands and thousands of newspapers and periodicals were shared, reaching women in remote new settlements hungering for fineries and romance. 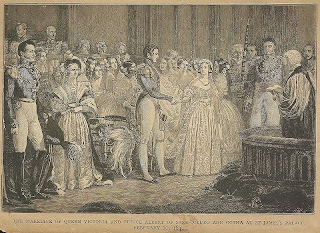 Queen Victoria's wedding was the talk." No wonder we were enchanted with Princess Diana and it is no surprise that all the major networks will be covering Kate's wedding beginning in the wee hours of the morning. What fun to know we are a part of a long tradition in our fascination with William and Kate's wedding.